The addition of the MAKO Robot demonstrates United Regional’s commitment to precision medicine and expands our regional leadership in robotic surgery. It all begins with a CT scan of your joint that is used to generate a 3D virtual model of your unique anatomy. 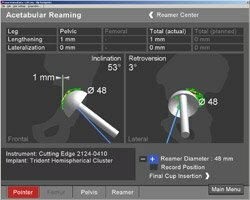 This virtual model is loaded into the Mako system software and is used by your surgeon to create your personalized pre-operative plan. 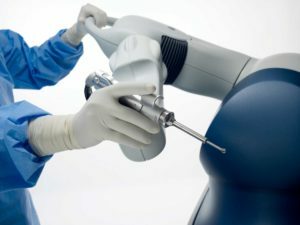 During an operation, the surgeon guides the Mako robotic-arm, which will limit their movements, as they prepare the bone for the implant, to within the boundaries set by the pre-plan. This means only the diseased bone is removed. The robot will then help with positioning the implant based on the patient’s anatomy. The Mako system also allows your surgeon to make adjustments to your plan during surgery as needed. When the surgeon prepares the bone for the implant, the Mako system guides the surgeon within the pre-defined area and helps prevent the surgeon from moving outside the planned boundaries. This helps provide more accurate placement and alignment of your implant. Partial knee replacements (PKR) are designed to relieve the pain caused by osteoarthritis (OA). By targeting the part of the knee damaged by OA, a surgeon can replace the diseased bone while helping to spare the healthy areas and ligaments surrounding it. 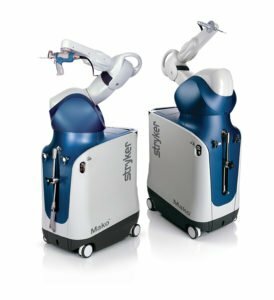 The stability and precision of robotics means that the task of knee resurfacing is made much easier. By limiting the unnecessary removal of healthy tissue and bone, and better positioning implants, trauma and pain is reduced. After surgery, your surgeon, nurses and physical therapists will set goals with you to get you back on the move. They will closely monitor your condition and progress.